GPA-72 Tactoo® Adhesive is a high strength, heavy-bodied, thermoplastic rubber adhesive, formulated for adhering anchors for hanging insulation. It bonds metal and nylon anchors to metal, concrete or masonry surfaces. GPA-72 Tactoo® Adhesive can be used to install metal or ceramic wall fixtures in tile applications. It is also recommended for use as a general-purpose construction adhesive in applications requiring a high strength bond, or in applications subjected to high temperatures. Use only after careful consideration of the warnings, directions and first aid instructions given. Use only adequate ventilation: Do not breathe dust, vapors or spray mist. Prevent static build-up. Properly bond and ground all containers and components. Vapors may ignite explosively. Keep away from heat, sparks and flame. Do not smoke. Extinguish all flames and pilot lights, and turn off stoves, heaters, electric motors, and other sources of ignition during use and until all vapors are gone. Surfaces to be bonded should be clean, dry and free of any oil, grease, frost or any other foreign matter which will impair adhesive. Do not use over painted surfaces. Clean all metal surfaces with methylene chloride, acetone or other degreaser, exercising safe practices as recommended by the manufacturer. 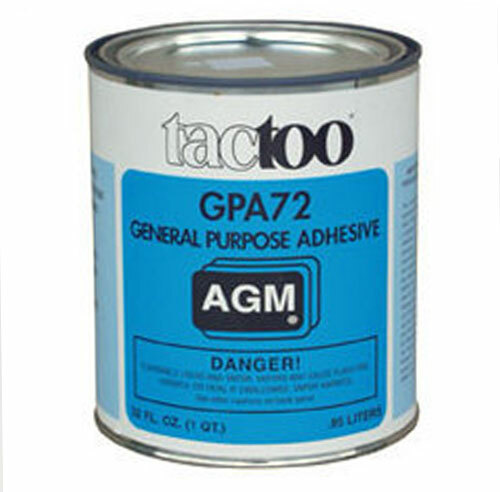 Some protective coatings are not compatible with GPA-72 Tactoo® Adhesive. Make a test bond before proceeding with application. GPA-72 Tactoo® Adhesive should be stored at room temperature (60° F to 80°F) for at least 24 hours prior to use. For best results, adhesive and materials to be bonded should be 30° F to 120°F. Prepare and install one anchor at a time. Apply a dab (the size of a small walnut) of GPA-72 Tactoo® Adhesive to the anchor base with a putty knife and immediately (maximum open time is 15 minutes) press anchor firmly into place, with a slight twisting motion. For proper adhesion, insure that the film of adhesive covering the anchor base (after the anchor has been firmly pressed into place) is approximately 1/16” thick and protruding through the perforated base plate. Application will be 95% dry after 48-72 hours at 75ºF and 50% relative humidity. Do not apply load until application is completely dry. Butter the back with GPA-72 Tactoo® Adhesive and immediately press in place with a slight twisting motion. Allow to dry 24-72 hours before subjecting to use. New concrete surfaces need to cure a minimum of 28 days in order to ensure best adhesion. All concrete surfaces should be higher-pressure water- or sand-blasted to remove any surface curing agents and all foreign matter. Spread GPA-72 Tactoo® Adhesive allowing solvent to flash off for several minutes before pressing anchor firmly into place. Do not apply load until application is completely dry. Applications will be 95% dry after 48-72 hours, at 75ºF and 50% relative humidity. Heat and humidity, or cold weather can cause longer drying times. Mineral spirits, exercising safe practices. Replace lid after each use and secure tightly for storage. Store out of direct sunlight in a cool, well-ventilated area. Avoid storing container directly on the floor or against an outside wall. This product contains silica quartz, a chemical known to the State of California to cause cancer. This product contains Toluene a chemical known to the State of California to cause birth defects or other reproductive harm.